Barely a few ounces in weight and bright violet in hue, gliding discs are the fitness tool equivalent of a barre class: They seem innocuous enough—even delicate—until suddenly your abs are quaking, there's a deep burn radiating from your glutes to your toes, and you're acutely aware of muscles you didn't even realize you had—doubly so the following day. All this, and you can stash them in an average-size handbag. 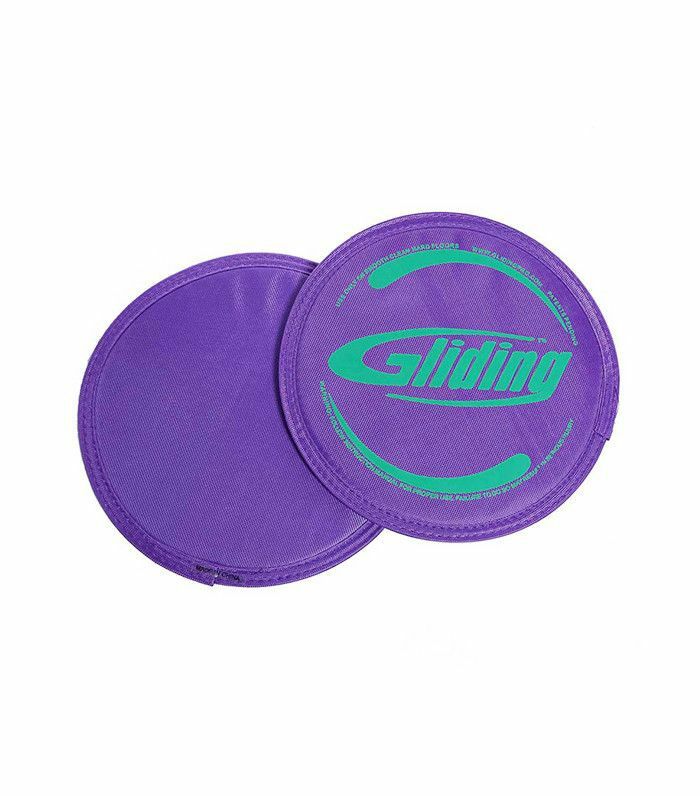 The secret is the way the fabric-covered circles challenge your balance: By sliding them under your hands or feet, you lose your grip from the floor and are forced to double down on your core strength in order to keep yourself stable. It's a convenient yet highly effective way to up the ante of classic bodyweight exercises like planks and bridges. In turn, you'll see results hand over fist. "I love gliding discs," says Simone De La Rue, the fitness guru behind the dance-based fitness regimen Body by Simone. (BBS is quite a favorite among the red carpet set: Rosie Huntington-Whiteley, Emily Blunt, Reese Witherspoon, and Naomi Watts are all regulars at De La Rue's L.A. studio.) The purple discs often make an appearance in the trainer's classes, but their real appeal is their portability. "They are so light and easy to travel with, so you never miss a workout," she says. "And they're [versatile], so they can target most areas for a full body blast." Below, De La Rue shares two of her favorite gliding disc exercises. Bonus tip: You can use towels in place of the discs in a pinch. Keep scrolling for a full-body workout you can take virtually anywhere. "This is my go-to for abs of steel," says De La Rue. Start in plank position, and place the disc underneath your right foot. Slide your foot toward your right shoulder trying to keep your leg straight. Make sure to engage your core and keep your navel toward your spine to protect your lower back. Start with 10 reps on each side. "A great booty-burn exercise," says De La Rue. "This works your hamstrings, as well." Start off on your back in a bridge position with your knees bent and shoulder blades and arms firmly planted into the floor. Place the disc underneath your heel. Be sure to use the correct kinetic chain and keep your knee underneath your hips. Glide your foot out to extend your leg while keeping the other bent. Static hold for three seconds, and then glide that leg back in as you activate your glutes. Start with one set of 10 on each side. Speaking of convenient workouts, check out these eight exercises you can do without leaving the couch.